We are a stand alone PADI certified, dive training center & we take the time to teach every student at their own pace. 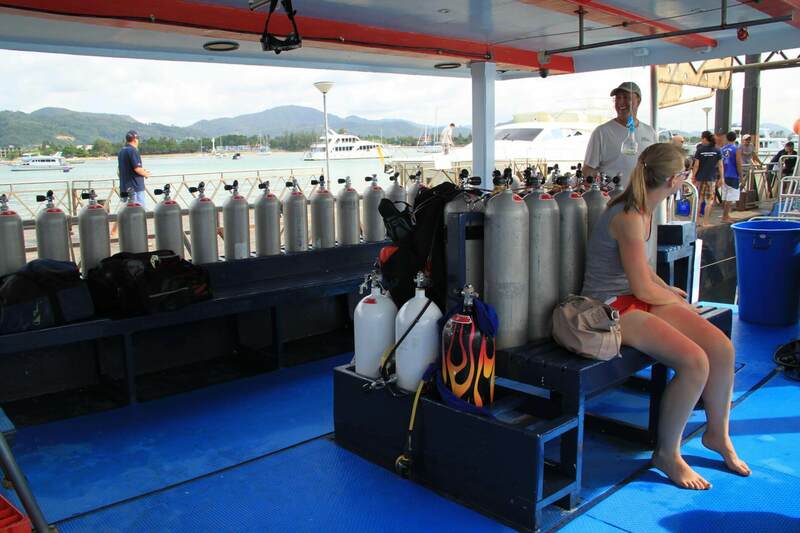 We own & operate our very comfortable 28M (90Foot) boat which is fully equipped to cater for all facets of Scuba dive training. Free Hotel transfers are included from 75% of Phuket & we also include return Airport transfers, to all those who book a course with us, this on it’s own is a saving to you of approximately $60.00 US. We have a 98 room partner hotel in Patong & can offer great accommodation packages too. We go out everyday except for 13th & 14th April which is the Thai holiday festival time of Songkran, the water festival. We depart Chalong Harbour at approximately 8.45am & return at 3-3.30pm after 2 dives. What a top operation. Great boat, great equipment and great crew. The facilities onboard are top notch and the Thai onboard cook prepares lovely meals. Will fully recommend Similan Queen Diving to my friends. The best diving I have ever experienced! We had the best experience diving with similian queen. The staff were so polite and lovely to us the entire trip. They were extremely well spoken in English and explained everything in an easy to understand manner. The reef was just spectacular and our instructor was well informed and willing to go the extra mile on our dive, not rushing us. We cant wait to go back next time we are in Thailand. We would highly recommend similian queen. I learned to dive on the Similan Queen my instructor was a guy Called Bank Nikrothanon. These guys helped me to develop a love for Scuba Diving, i have been diving for 7 years and have completed over 250 dives. I have returned to dive with the Similan Queen mob in Thailand on many occasions. The boat and crew are great they provide a safe friendly environment that supports divers to enjoy their time in the water. The food on board is also good. I will return and dive with them again this year and have no problems recommending them, the service they provide is of a high standard and it is good value for the money charged. Fantastic experience with excellent crew and a professional company. Keep up the good work. Certainly will be back. Great safe diving company. You never feel you are alone , beautiful diving sites , lovely boat and great food and hospitality. Will I come back. Yes and off course dive again with Similan Queen diving centre. We spent a day onboard Similan Queen & were very impressed. The trip to Racha Yai & back was smooth & quicker than expected ensuring we maximised our time in the water. The facilities onboard were first class & the teams local knowledge was invaluable. Lunch options were also excellent. All in All, the professionalism & hospitality shown by Ric & his team onboard Similan Queen ensured our day was one we will always remember. I highly recommend Similan Queen to anyone considering this memorable experience.